As you may know (if you've read last week's post or follow me on the 'Gram) I recently had my brows microbladed again. One of the worst parts of the treatment is the healing process; incredibly itchy brows, urges to pick scabs, trichotillomania and not being allowed to touch your brows do not mix well at all. I've used false nails before to try and curb my dermatillomania (skin-picking) during particularly bad patches and found it worked quite well, so I thought I'd try them out again to see how they fared against healing brow tattoos. 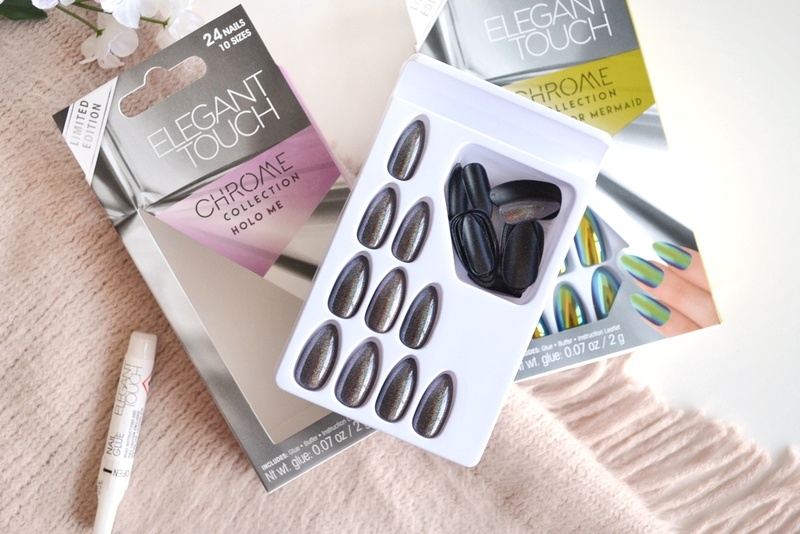 I had been sent these funky Elegant Touch nails to review so what better time to give them a whirl?! 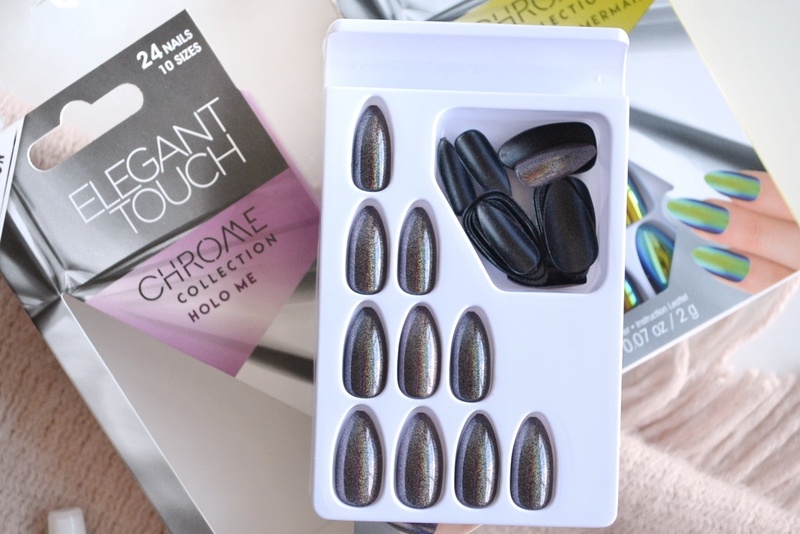 The nails in question are from the relatively new Chrome Collection from Elegant Touch (launched towards the end of last year). The super-cool range features four different styles- all are stiletto shaped and run along the holographic theme but vary in colour. I used to really dislike stiletto nails (doing any small task with long, pointed claws becomes difficult!) and much preferred shorter, more square shapes. However, having tried shorter styles and finding that it was much easier to continue picking at my brows with them on, I persevered with stilettos...and I'm so glad I did! Whilst I do still struggle to do most things whilst wearing long nails, this also includes picking at my cuticles and pulling my lashes/brows out...anything which can prevent this is an automatic win in my books. Although this shape isn't for everyone (unfortunately the Chrome Collection doesn't offer an alternative), I have found it is the best one to stop my trichotillomania as I can't get a good enough grip on the hairs. 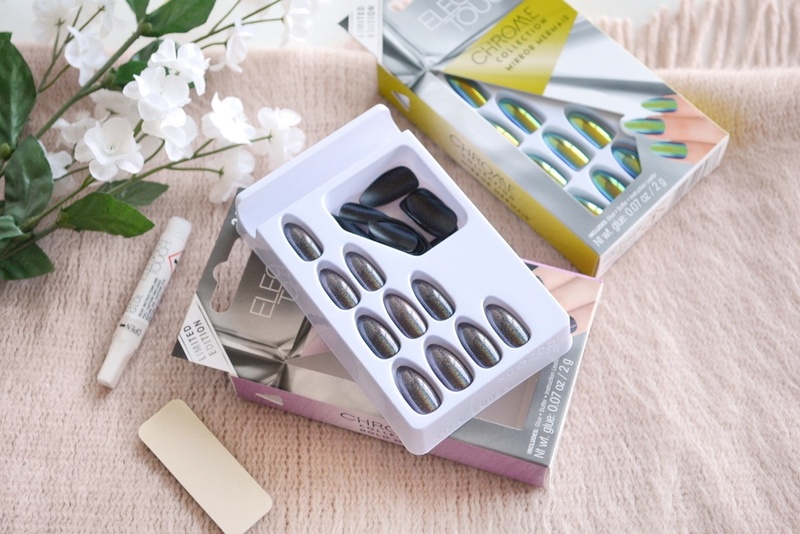 The nails themselves are really sturdy and I found that generally the sizes fitted with my own nail beds really nicely. There are 10 different sizes, which does also help a lot! I've used Elegant Touch nail glue in the past and it is pretty good. They lasted around 5 days before the first one pinged off- that's pretty good going seeing as my clumsy nature means they normally start getting lost after day 2! Perhaps the fact that for those 5 days I didn't have the opportunity to do anything clumsy had something to do with it (I didn't move from the sofa because I was ill with flu)....or they could just be really good quality nails! I ended up really liking the style I'm wearing in the photos ('Holo Me'). 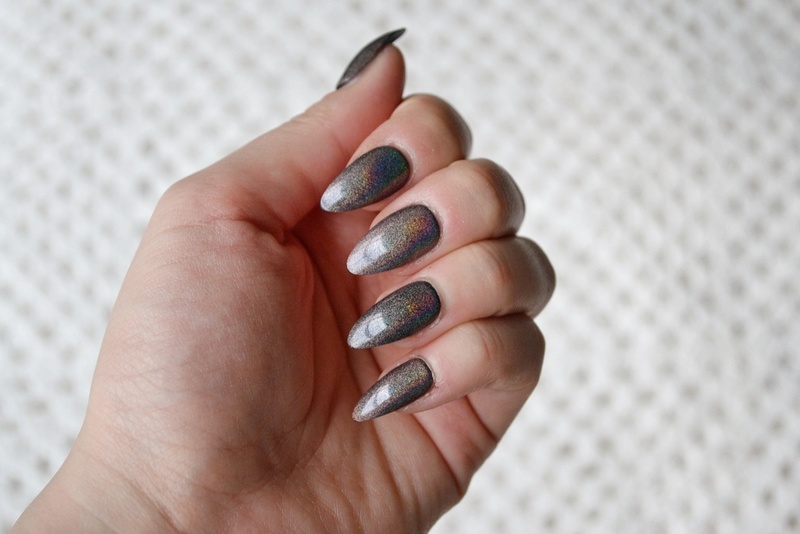 The darker base colour is more up my street and I found the holographic-ness was slightly more subtle (I don't really do blingy nails!). 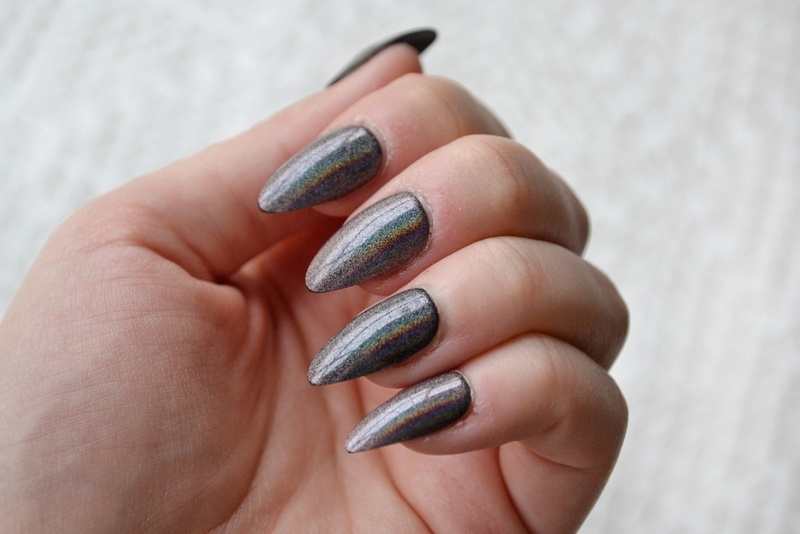 The style 'Chrome Kisses' also looks gorgeous; a pretty pink shade with a funky, shiny twist. Each set costs either £8.95 or £9.95 which, in my opinion, is quite a lot, but there are often offers in Boots and Superdrug. 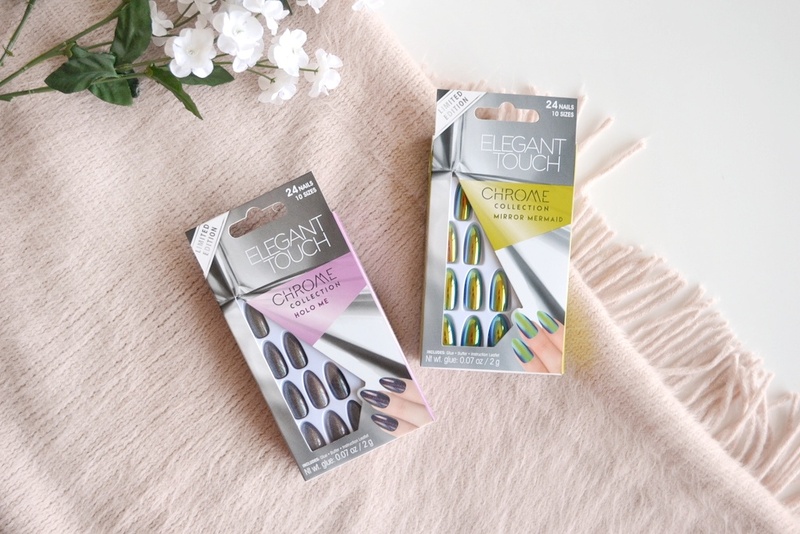 Elegant Touch nails are always really fab quality and foolproof- you have pretty nails in under 5 minutes! Which brand is your favourite for false nails? Have you ever had any success with using false nails to help with dermatillomania or trichotillomania?